Hello all you wonderful people out there! 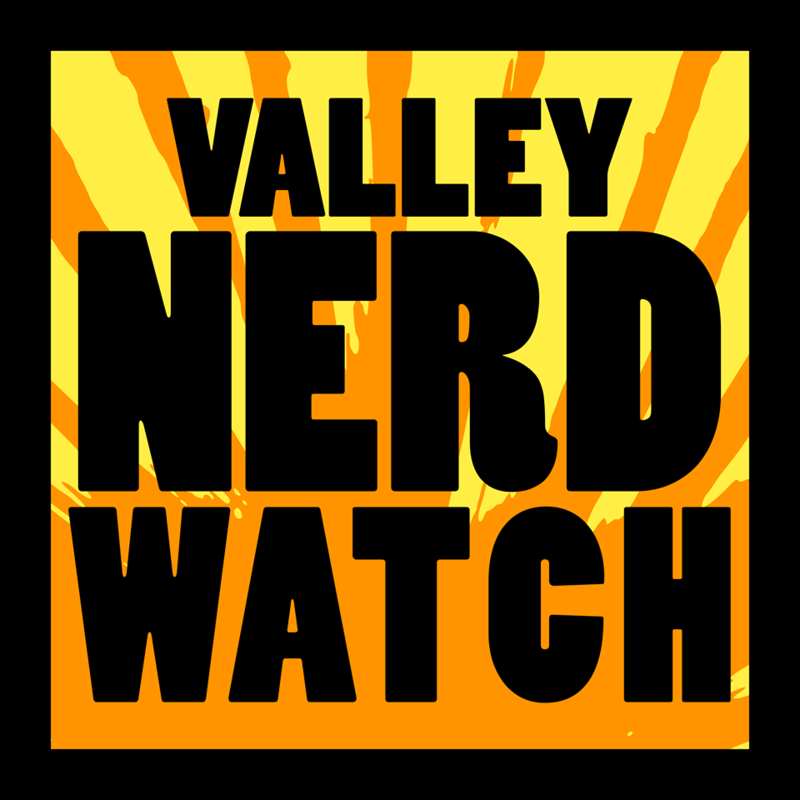 We’re extremely glad to bring you another issue of the Nerd Watch! This week let’s celebrate that local creators at Make Big Things made not just double, not just triple, not just quadruple, but QUINTUPLE their Kickstarter goal for their new game Damn the Man, Save the Music! They’re putting out an absolutely delightful sounding game about saving a failing record store in the mid-1990s! And they made enough to hit their stretch goal of releasing an extra Sci-Fi/Douglas Adams inspired game “The Record Store at the End of the Universe”. Make Big Things is one of the prides of the Valley, making tabletop RPGs that plumb interesting experiences and innovative play styles, and you owe it to yourself to check out their recent release Noirlandia as well as their original game Questlandia! Yay for Make Big Things! Learn the most tiny and fun of guitars: Ukulele! Sooner than you think you’ll be belting out songs and by the end of the hour you’re going to have a seven-album recording deal with a major studio, we guarantee it! Create your own alphabet and learn the art of hand-lettering! All the supplies will be provided and you’ll also get a copy of “The Sun is Also a Star” which sounds neat and accurate. You’re going to use it for a string art project next meeting! Also there are refreshments and AC! Come to the Mead to experience the wonder of air conditioning and making good art! Visitors are invited to participate in a variety of fun activities, from film screenings to art-making! Keen zines for zine fiends, never before seen zines, zines for teens and tweens, Halloween zines, zines about queens, all the zines you can fit in your… … machine! Learn about upcycling from Lou’s Upcycles! You’ll learn about how to make plastic bags useful again view the process of fusing them! Fuse and reuse, we always say! Play games with your family and friends! It’s a good night for a bunch of friendly people! Play games with your family and friends! It’s a good night for a bunch of friendly people! With a Mission Cantina food truck and good beer! Kick off the GPL Thoreau celebration we’ve decided to call Thoroughly Thoreau Thrills! This open-mic night will be a chance to read your favorite Thoreau works! Kory Stamper, Lexicographer for Merriam-Webster, takes you through how dictionaries are made and helps you understand the complex world of obsession over every single word! A must-see if you want to get in on the ground floor of this year’s hottest new words, like strealf and minump. Come discuss what Thoreau thought about Cape Cod, and enjoy some cake and refreshments in celebration of his birthday! Weirdly most of his thoughts about Cape Cod had to do with the quality of the Mozzarella sticks at local eateries. Register for the discussion at 413-283-3330 and pick up a copy of the book at the library! Find Waldo in the Pioneer Valley Party and Grand Prize Drawing! Did you find Waldo at local businesses this summer? Well, if you found 20 or more Waldoes, you’re eligible for the Grand Prize drawing.. If you found fewer than 20 you’re eligible for a great party with snacks! Modern Myths at the Sidewalk Sale! Get a bunch of great books for really cheap! Old comics for less! Graphic novels half-off! It’s a deal bonanza! Get a bunch of great books for really cheap! Old comics for surprisingly litte! Graphic novels half-off! It’s a deal extravaganza! Get a bunch of great books for really cheap! Old comics for amazing prices! Graphic novels half-off! It’s a deal stanza! Get a bunch of great books for really cheap! Old comics for practically nothing! Graphic novels half-off! It’s a deal that exists! Eric Carle’s meeting with Leo Lionni in 1952 led to not just a job but also a long friendship! Eric Carle will be joined by Annie Lionni, granddaughter of Leo Lionni, as they share their memories of Leo Lionni and discuss the parallels between Carle and Lionni’s careers! There’s a Q&A afterward and a light reception! Books autographed by Eric Carle will be available in the Museum Shop! Enjoy jousting, delicious food, bards, fire shows, magic, games, and excitement for all ages! Tickets are $15 for adults, $10 for ages 6-15, and children 5 and under are free! Balloon artistry, magic, comedy, improv, and more in this action-packed performance that’s a Minecraft fan’s dream! Join Jungle Jim on stage for the Building Block Madness Tournament, the Zombie Chase, and the Balloon Firework Rocket Extravaganza! Reading is Magic! With Ed the Wizard! It’s not often that one of the legendary Order of the Silver Secrets comes to our humble Valley but when they do, they love to teach people about how reading is a kind of magic we can do every day! Ed also teaches kids how to brew a potion that turns people into newts but that’s his own thing, the Order has specifically requested he not do that at these events. Enter the world of stories via puppets! Humorous, colorful puppet people will get kids laughing and learning and generally feeling like hey stories are very fun and good and so are puppets. Recommended for kids ages 3-10! Registration required ahead of time! Hunt your friends through the library and then shoot them with lasers! Ice cream! Water games! We assume that water games are where you just play videogames but under water. There are also drawing for raffles during the party! See if you won anything! Also you did win something: ice cream. Celebrate Hector Fox and his woodland friends! Author/Illustrator Astrid Sheckels will appear as Hector the Fox himself! Sign up to reserve your spot in this world of imagination! 413-772-1544 x5104! Starlight Theatre presents The Little Mermaid Jr. The Starlight Youth Theatre is proud to present Disney’s beloved Little Mermaid but with adorable kids, we presume! We’re pretty sure the players are youths and that’s why it’s the Little Mermaid Jr. It’s possible that the youth just run the theater company. Let the Fire Burn is a 2013 documentary film about one of the of the most under-reported clashes between the government and US citizens in our history: the stand-off between MOVE and the Philadelphia Police Department. This horrifying event is brought to life through archived news coverage and interviews. Based on the true story of a young girl from the streets of Uganda whose world changes when she’s introduced to chess! Thanks to the support of her family and community, she pursues her dream of becoming an international chess champion! Free and open to the public! Egon Schiele’s tender portrait of his mistress was locked up in a legal battle between the Leopold Museum and the Jewish family from whom the Nazis seized the painting in 1939. Learn more about the history of this iconic image, from the painting of it to the theft to the post-war confusion and resurfacing of the image! Meet and learn about the coolest birds! Sorry songbirds you’re very neat but these are the best birds because they are very fast and make loud, terrifying shrieks. Tom Ricardi, an avian expert who operates a rehab center for birds of prey in Conway MA, will be on hand to demonstrate and teach you about these beautiful animals!